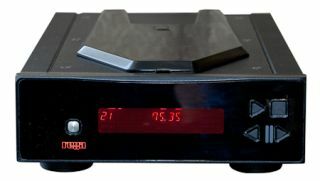 Manchester Show 2011: Rega previews Apollo-R player | What Hi-Fi? We've had the first look at (and listen to) the new Rega Apollo CD player - the Apollo-R – here at the Manchester Show. The top-loading Apollo-R follows the Award-winning Brio-R amplifier in both its naming convention (R stands for remote control) and compact dimensions. Both CD player and amplifier will also operate from the same remote, too. Rega's new Apollo-R uses the same Wolfson 8742 DAC as the company's standalone DAC (reviewed here). You can boost your digital audio still further by using the two products together with the Apollo-R acting as a transport; the result is even better sound quality, Rega claims. The Rega Apollo-R will be available in late November, priced £548. We hope to review it in our January issue, which is on-sale early December. The player shown in our pictures here (sitting with its siblings on a suitably compact Custom Designs rack, below) is a prototype - the full-production model will have superior fit/finish. In other Rega news, the company's Southend-on-Sea factory is being kept busy with booming worldwide orders for turntables. Rega says it's selling more than 1500 turntables a month as the vinyl revival continues (as this news story earlier this week reflects).